I'm assuming Harrison-Borland-Booker is the odds-on favorite for next year? I don't think Booker will be a starter next year, did he even play in the B1G CG or the Cotton Bowl, I don't remember seeing him. Good luck to Mr Baker. I can't argue with that - I think it's hard for my mind to get around the fact that Booker was so hyped in 2016 and then got injured (leading to Baker's ascension IIRC). Was thinking/hoping he'd be able to get everything together for 2018. Rumor from another site is that Booker will declare! Browning gonna be a beast next year. Similar to Okudah, i'd be shocked if Browning isn't starting next year. As long as Bill Davis doesn't tell him to run the wrong way. With Hilliard coming in for Harrison and/or Browning. Justin Hilliard was a 5* out of St X. Why no mention of him? He was such a stud at St. X. Maybe hardest-hitting high school player I've ever seen. I remember him knocking down 300 pound LT's love his speed, hope he's able to make it happen! Sometimes, the missing ability is availability. He battled injuries for so long, he's kinda got lost in the shuffle. But I think he definitely stood out on special teams in the Cotton Bowl, and with his athleticism I think he'll be a starter next year. Not sure if anyone has earned favorite status. I would hope there's a lot of competition for the LB spots because that group struggled a bit. I would say Borland is a near lock at this point. But the other 2 are certainly up for grabs. I wouldn't call it a near-lock, but Harrison has got to be pretty close given how much he played at the end of the year. Baker will be missed. Great talent behind him, but very good leadership and skill himself. He led all LB's in most of their biggest games ... 7 tackles vs OU, 7 vs PSU ... about the only LB to show up vs Iowa with 8 ... and a whopping 16 tackles (7 for loss) vs Wisconsin. He led the team in tackles, and led all LB's in passes broken up. Won't lie, I'm slightly surprised by this decision. Still a great talent and I expect him to have a great career in the League. I'm not. I always viewed his departure as likely (although not certain), despite some some slippage in production this year up until the final few games. And he should do very well at the combine, and someone will ignore the lapses in positioning in favor of exceptional athleticism. Yep. Plays in Western PA, wears black, loves gorging themselves on Buckeyes, may need to replace 1 freakshow from OSU with another one that is also a raw but very coachable kid. Baker has Pittsburgh written all over him. Only issue is that he probably won't be available at pick 64 and not sure he is worthy of the 32nd pick with the needs at Safety, TE and QB heir. To be sure, he had a rough year at times (which is what I assume you're referring to). But he put a lot of good things on tape last year (and, at other times, this year, too). And he strikes me as one of those guys who will destroy the NFL Combine. So I suspect he'll go in the first 1-3 rounds, regardless of a somewhat disappointing 2017. Many players with sophomore breakout seasons tend to regress in year 3. I think evaluators will look at their breakout season to determine their ceiling and their regression to point out their deficiencies. Baker is a solid prospect. Same thoughts. Surprised. He even says he will drop a few rounds due to this season. That would put a bad taste in my mouth to try and get back to playing like a first round pick. However, he played really well the last few games of the season and I hope he goes high in the draft with good workouts. Get get some money young lad. If you have to go 20 games back to find the highlight I'm not sure he has the habit of doing it. I hope he does well but he really could've helped himself with a strong final year. If you have to go 20 games back to find the highlight I'm not sure he has the habit of doing it. Anyone know when we'll have confirmation of all early departures? I believe next Monday, the 15th, is the draft declaration deadline. January 15th is the deadline to announce. January 15 is the deadline I believe. September 1. If you don't see someone out there, he might not be on the team anymore. If he can develop the natural feel/instincts at LB, then he could be a fantastic pro. Athleticism is there for sure. Best of luck! Thank you for the memories Jerome!! Good luck in the NFL and look forward to you being a great player. The back seven will be slightly green but stellar. LB may be our deepest position. With lack of depth at DE, it will be interesting to see what, if anything, Schiano/Grinch/Davis do differently with the OLBs, i.e., a sort of hybrid 4-3 but with an OLB playing as a standup DE? I wouldn’t mind seeing what Browning and Harrison out there together as taller, leaner bookends gives us. I think it’s a good move by Baker. He’ll test off the charts at the combine and I don’t know that he’d improve his draft position if he stuck around. Top 5 among LBs is pretty damn good. Barring injuries we are good at DE and wouldn't want to take them off the field, we just won't have enough to be the whole DL. I think we'll be okay. Harrison got better as the season went on and I think will take the next step next year. Borland showed a real knack for the middle. Browning, Keandre Jones, and Werner will push to start. 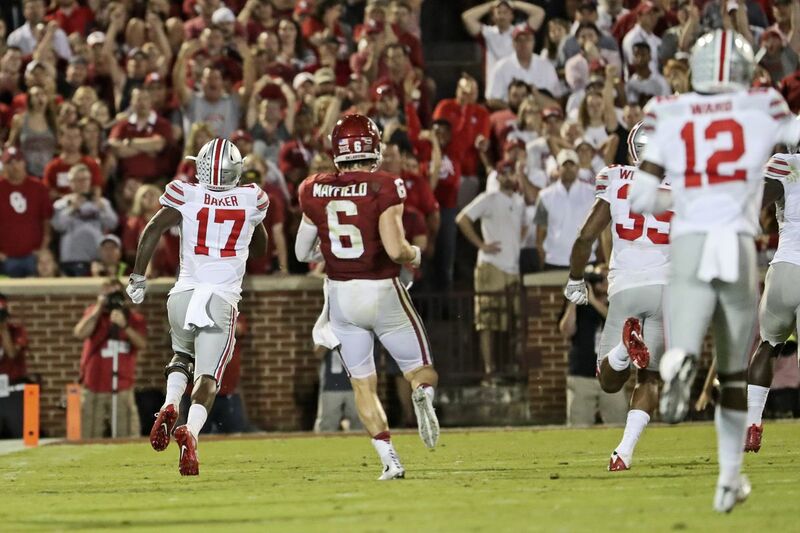 Maybe Justin Hilliard will reach his potential. Plus, we have some talented folks coming in. Hopefully Billy Davis will take the next step as a coach. Sure do miss Fickell though. However, I remember the #firefickell days. Inexperience is there but so is talent. Given the struggles at the spot this year in some games I imagine some infusion of new guys could be a boon too. Loads of talent to bring into those spots and see how they do. Go get it Bake! Thanks for all your hard work! Hey, who the hell let Baker Mayfield in here? All he's gonna do is douche the place up. Nice DV, Bake. I'm happy for him and hope he's an instant impact rookie. However, I really had some high hopes that he'd be back as he stands to drastically improve his Draft stock by demonstrating more discipline in pass coverage next season. The guy has serious upside and I love that he gets to fulfill his dreams, but I'll miss him wearing the S&G. Go get paid my man! Thanks for all you've done at OSU. Once a Buckeye, always a Buckeye. Thank you JB for everything! Ohio born and bread! Go get em! I love bread from Ohio!! Best of luck Mr. Baker, thanks for everything. Meh, think we have better linebackers waiting. Hoping for Jones and Campbell to stick around for 1 more year. Congrats to him! Also a congrats knowing that the Browns will never draft you. I watched Draft Day this weekend. I told my wife that the first clue it’s fictional is the Browns drafted a guy from Ohio State. Lol. I can't believe that no one has tried to make an updated version of Major League for the Browns. Any word on Sheffield potentially declaring for draft? Considering it's an article and subsequent comment section for Jerome Baker, probably not. Over/under on his 40 at the combine? All I know is the fat linebackers of the SEC will be way behind. He was amazing against TTUN in 2016 and Wisconsin this year in the Big Ten Championship. I hope he is great in the NFL! Crazy thing about the Wisconsin game is had about 1/4 of his season's tackles that game. Which tells how great he played that game, and just how lackluster he was leading up to it for the entire season. Yep, definitely a 2 game season for him. Finished well. Probably enough tape to warrant a 2nd round pick on if he does well at the combine/pro day. A certain team who likes to draft OSU players may need to fill a huge spot in their linebacking core under unfortunate circumstances, and he could be that guy. best games in last 2017 B1G biggest games = finished strong. Good luck in 'the league' Jerome. Good luck ! Tough sport, make that paper while you can ! I’ll wish him well but he’s not ready. I wonder if any coach told him that? Great upside, but still raw. Baker was candid all year in acknowledging that he did not play up to his own expectations this year and needed to improve. Something important to keep in mind, though, is that Baker has a young daughter. Even if he felt like another year at Ohio State could have improved his draft stock, going pro and getting paid still might have been the best decision for him. Unless we're in their shoes, we have no idea why they make these decisions. But I'd bet my bottom dollar Dan's right. Having mouths to feed makes this a fairly easy decision. Good luck Bake! Makes us proud!! Best of luck Jerome, and thank you. Buckeye for life. Baker cost himself some draft stock this season. If he had played well vs. OU and Iowa he'd be a 1st round pick. He wont go as high as Raekwon did last year but he wont fall out of the 2nd round. Booker/Harrison could get some reps at DE. Definitely think that should be considered for Booker. He just hasn't looked like he has the instincts for LB, for whatever reason. But I think he has just enough size to be a situational pass rusher. Seems like we have more depth at LB, I'm all for it. Another Buckeye rides off into the Ohio sunset. Good luck, Baker. Will root for you no matter where you land in the NFL! Once a Buckeye, always a Buckeye! I am sorry I would get a down vote. I don't disparage Mr. Baker. Good for him. Best of luck. I watched the games, and he seemed to take many plays off this year. If that insults you , I am sorry. I think he is a good player, and " Good Bye " to him. Jeez, these DV’s seem to be spreading like the flu; WTH people?? Best of luck with anything you try young man. Hoping the future goes great and you have much fun. Hope Hilliard gets some extended playing time. Think Werner is a Meyer favorite. Thank you sir, it was a pleasure watching you play. Sorry to see Baker go. Great player, great Buckeye. Will be a valuable, athletic addition to an NFL team. Good luck J Baker! Had a feeling that would happen, but now it's next man up. Mr. Browning, come on down! Good luck to the REAL Baker. Baker has a ton of talent, when he wants to show it. He’s got the tools to be a good one in the NFL. Stay on your grind, kill the combine, and go get yours. CLE Boys in the building! JB thanks for the on & off the field quality time given to OSU, & hopefully being a Buck will assure you the next level you seek. Good luck. I'd like to see him stripes-the Bengals kind. He really stepped up his game in post-season-B10 Championship/Cotton Bowl. Good for Jerome and GOOD LUCK! Load the next Silver Bullet. Dude is gonna light up the combine. He played at times terrible this season (self-admitted) but showed at the end of the season he still has it. I'll be shocked if he makes it past the second round. My two cents when he gets into NFL interviews just be brutally honest. They are going to want to know why the play dipped from season to season. If it was truly a nagging injury then say so. If it was looking ahead to the NFL and worrying about not getting injured so you could support your daughter then say so. People want to point to coaching but coaching doesn't explain the drop in sideline to sideline speed and the lack of desire to chase down plays. Something changed from last season to this season. Wish him nothing but the best. Should put up good combine numbers and if he works his tail off should land a mid round draft grade and get paid to do something he loves. It's always bittersweet to see players move on, but that's college football. You can't keep them forever. Good luck in the NFL, Jerome. Come back and complete your degree. Wouldn't surprise me at all to see him go in the first round. This season may be used some to evaluate, but mostly it is projection on what he will be like as a pro ... not what he did in college. If he kills the combine, he could go in the first round. Sigh - to be expected and I get it - but I still don't have to be happy about it! Thank you for the memories & good luck with the next stage of your life journey Mr Baker. Worked out a lot better then being a Gator, didn’t it Jerome? Best of luck in the NFL, get paid young man. We need more depth at LBer. The only solid for sure starter is Tuf. Love the kid. We should all 3 positions locked down as far as who is next. So now we start another year with "wait till the lber's mature" or wait till the DB's come around. Our OL looks good-DL looks good and WR's and RB's all have depth. If Borland did not get PT due to injury we would be starting 3 new LBer's. Maybe I am missing something. I think due to injuries, Hilliard is flying under the radar right now...But he finished last season strong on special teams. He was a big time recruit, and I wouldn't be the slightest bit surprised to see him starting in Baker's spot next year.